This layout is based on the design called Inglenook Sidings, which combines a seemingly simple layout with a clever design in problem solving. It was originally designed by Alan Wright in the 1970’s, and this particular layout has taken this and adapted it for the public to operate, rather than the operator behind the layout . I am very grateful to a fellow CVMRC member, Jim Robinson, whose help in developing this layout in many ways has greatly added to the working of the layout and its appearance. 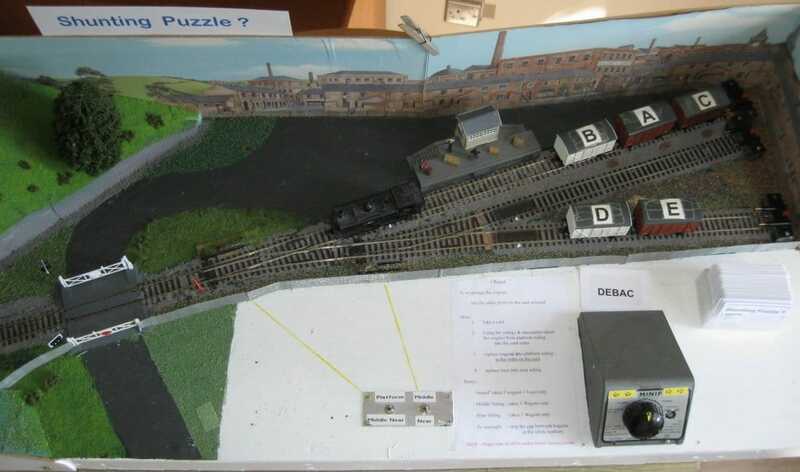 This is one of the few layouts where the public can try their hand at controlling a locomotive to shunt wagons, and also operate the points. 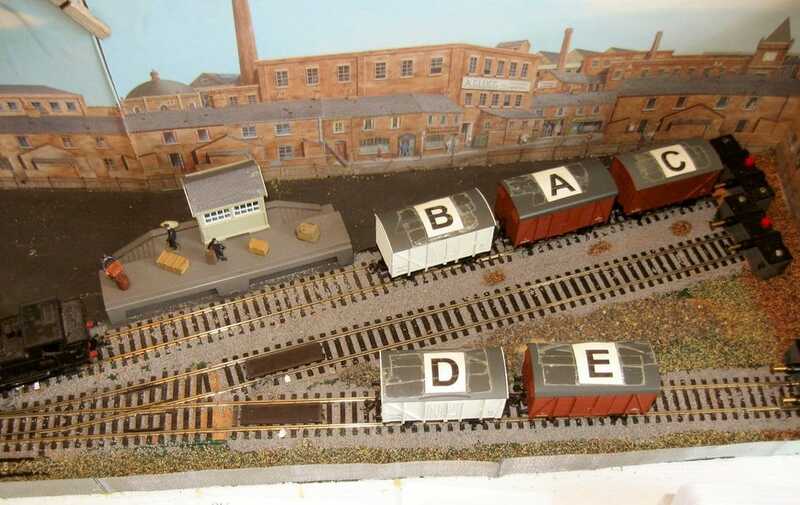 There are usually 5 wagons, each labelled A to E, and the person who operates it is asked to select a card, each of which has a different variation of the five letters. The puzzle is to rearrange the wagons with limited siding lengths (only 3 wagons in each siding) to reflect the arrangement on the card. Afterwards the card is retained by the operator behind the layout, and this gives an indication of the number of public operators have completed the puzzle. It has been surprisingly popular and since it has been taken out to exhibitions 1700 members of the public have successfully completed the puzzle . 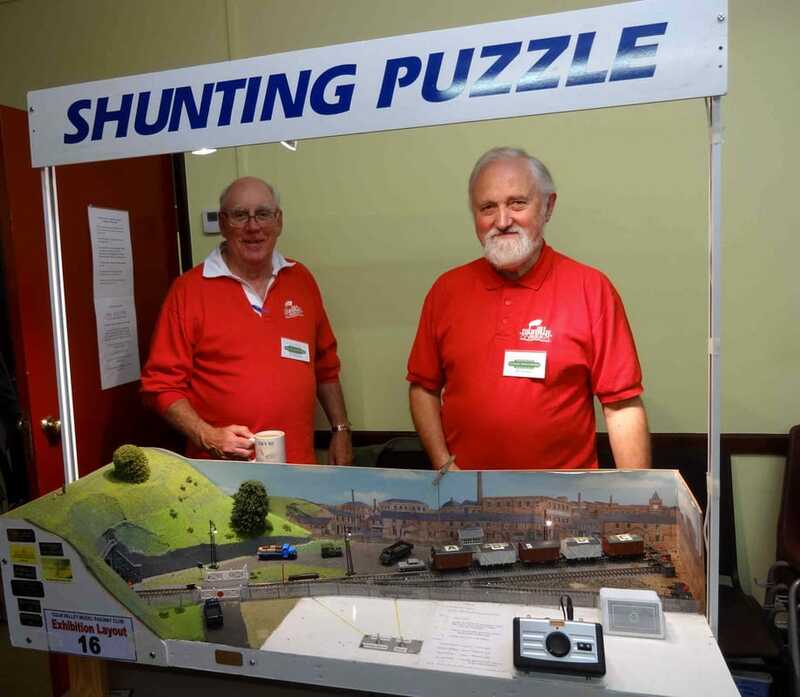 It is now in its 7th year (2018), and over 2000 members of the public have operated this remarkable little layout. It has been to exhibitions as far as Buckfastleigh and Corsham, Templecombe in Dorset and Burnham in Somerset, and many places in between. The layout is in OO Gauge and measures 4 feet by about 1.5 feet. This layout also demonstrates Kadee couplings as seen in the pictures. Jim & Bill ready to go at a recent exhibition.